Blastulation: 1 - morula, 2 - blastula. The blastula (from Greek βλαστός (blastos), meaning "sprout") is a hollow sphere of cells, referred to as blastomeres, surrounding an inner fluid-filled cavity called the blastocoele formed during an early stage of embryonic development in animals. Embryo development begins with a sperm fertilizing an egg to become a zygote which undergoes many cleavages to develop into a ball of cells called a morula. Only when the blastocoele is formed does the early embryo become a blastula. The blastula precedes the formation of the gastrula in which the germ layers of the embryo form. A common feature of a vertebrate blastula is that it consists of a layer of blastomeres, known as the blastoderm, which surrounds the blastocoele. In mammals the blastula is referred to as a blastocyst. The blastocyst contains an embryoblast (or inner cell mass) that will eventually give rise to the definitive structures of the fetus, and the trophoblast, which goes on to form the extra-embryonic tissues. During the blastula stage of development, a significant amount of activity occurs within the early embryo to establish cell polarity, cell specification, axis formation, and regulate gene expression. In many animals such as Drosophila and Xenopus, the mid blastula transition (MBT) is a crucial step in development during which the maternal mRNA is degraded and control over development is passed to the embryo. Many of the interactions between blastomeres are dependent on cadherin expression, particularly E-cadherin in mammals and EP-cadherin in amphibians. The study of the blastula and of cell specification has many implications on the field of stem cell research as well as the continued improvement of fertility treatments. Embryonic stem cells are a field which, though controversial, have tremendous potential for treating disease. In Xenopus, blastomeres behave as pluripotent stem cells which can migrate down several pathways, depending on cell signaling. By manipulating the cell signals during the blastula stage of development, various tissues can be formed. This potential can be instrumental in regenerative medicine for disease and injury cases. In vitro fertilisation involves implantation of a blastula into a mother’s uterus. Blastula cell implantation could potentially serve to eliminate infertility. The blastula stage of early embryo development begins with the appearance of the blastocoele. The origin of the blastocoele in Xenopus has been shown to be from the first cleavage furrow, which is widened and sealed with tight junctions to create a cavity. In many organisms the development of the embryo up to this point and for the early part of the blastula stage is controlled by maternal mRNA, so called because it was produced in the egg prior to fertilization and is therefore exclusively from the mother. In many organisms including Xenopus and Drosophila, the mid-blastula transition usually occurs after a particular number of cell divisions for a given species, and is defined by the ending of the synchronous cell division cycles of the early blastula development, and the lengthening of the cell cycles by the addition of the G1 and G2 phases. 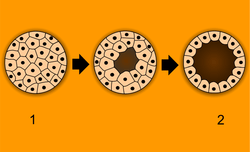 Prior to this transition, cleavage occurs with only the synthesis and mitosis phases of the cell cycle. The addition of the two growth phases into the cell cycle allows for the cells to increase in size, as up to this point the blastomeres undergo reductive divisions in which the overall size of the embryo does not increase, but more cells are created. This transition begins the growth in size of the organism. A blastula is a sphere of cells surrounding a blastocoele. The blastocoele is a fluid filled cavity which contains amino acids, proteins, growth factors, sugars, ions and other components which are necessary for cellular differentiation. The blastocoele also allows blastomeres to move during the process of gastrulation. In Xenopus embryos, the blastula is composed of three different regions. The animal cap forms the roof of the blastocoele and goes on primarily to form ectodermal derivatives. The equatorial or marginal zone, which compose the walls of the blastocoel differentiate primarily into mesodermal tissue. The vegetal mass is composed of the blastocoel floor and primarily develops into endodermal tissue. In the mammalian blastocyst (term for mammalian blastula) there are three lineages that give rise to later tissue development. The epiblast gives rise to the fetus itself while the trophoblast develops into part of the placenta and the primitive endoderm becomes the yolk sac. In mouse embryo, blastocoele formation begins at the 32-cell stage. During this process, water enters the embryo, aided by an osmotic gradient which is the result of Na+/K+ ATPases that produce a high Na+ gradient on the basolateral side of the trophectoderm. This movement of water is facilitated by aquaporins. A seal is created by tight junctions of the epithelial cells that line the blastocoele. Tight junctions are very important in embryo development. In the blastula, these cadherin mediated cell interactions are essential to development of epithelium which are most important to paracellular transport, maintenance of cell polarity and the creation of a permeability seal to regulate blastocoel formation. These tight junctions arise after the polarity of epithelial cells is established which sets the foundation for further development and specification. Within the blastula, inner blastomeres are generally non-polar while epithelial cells demonstrate polarity. Mammalian embryos undergo compaction around the 8-cell stage where E-cadherins as well as alpha and beta catenins are expressed. This process makes a ball of embryonic cells which are capable of interacting, rather than a group of diffuse and undifferentiated cells. E-cadherin adhesion defines the apico-basal axis in the developing embryo and turns the embryo from an indistinct ball of cells to a more polarized phenotype which sets the stage for further development into a fully formed blastocyst. Xenopus membrane polarity is established with the first cell cleavage. Amphibian EP-cadherin and XB/U cadherin perform a similar role as E-cadherin in mammals establishing blastomere polarity and solidifying cell-cell interactions which are crucial for further development. Experiments with implantation in mice show that hormonal induction, superovulation and artificial insemination successfully produce preimplantion mice embryos. In the mice, ninety percent of the females were induced by mechanical stimulation to undergo pregnancy and implant at least one embryo. These results prove to be encouraging because they provide a basis for potential implantation in other mammalian species, such as humans. Blastula-stage cells can behave as pluripotent stem cells in many species. Pluripotent stem cells are the starting point to produce organ specific cells that can potentially aid in repair and prevention of injury and degeneration. Combining the expression of transcription factors and locational positioning of the blastula cells can lead to the development of induced functional organs and tissues. Pluripotent Xenopus cells, when used in an in vivo strategy, were able to form into functional retinas. By transplanting them to the eye field on the neural plate, and by inducing several mis-expressions of transcription factors, the cells were committed to the retinal lineage and could guide vision based behavior in the Xenopus. ↑ "Blastula". Encyclopedia Britannica. 2013. 1 2 3 Gilbert, Scott (2010). Developmental Biology 9th Ed + Devbio Labortatory Vade Mecum3. Sinauer Associates Inc. pp. 243–247, 161. ISBN 978-0-87893-558-1. ↑ Lombardi, Julian (1998). "Embryogenesis". Comparative vertebrate reproduction. Springer. p. 226. ISBN 978-0-7923-8336-9. 1 2 3 4 Cockburn, Katie; Rossant, Janet (1 April 2010). "Making the blastocyst: lessons from the mouse". Journal of Clinical Investigation. 120 (4): 995–1003. doi:10.1172/JCI41229. 1 2 3 Heasman, J (November 1997). "Patterning the Xenopus blastula". Development (Cambridge, England). 124 (21): 4179–91. PMID 9334267. ↑ Tadros, Wael; Lipshitz, Howard D. (1 March 2004). "Setting the stage for development: mRNA translation and stability during oocyte maturation and egg activation in Drosophila". Developmental Dynamics. 232 (3): 593–608. doi:10.1002/dvdy.20297. PMID 15704150. ↑ Gourdon, John B.; Standley, Henrietta J. (Dec 2002). "Uncommitted Xenopus blastula cells can be directed to uniform muscle gene expression by gradient interpretation and a community effect". The International Journal of Developmental Biology (Cambridge, UK). 46 (8): 993–8. PMID 12533022. ↑ Toth, Attila. "Treatment: Addressing the Causes of Infertility in Men and Women". Macleod Laboratory. Retrieved 22 March 2013. ↑ Kalt, MR (August 1971). "The relationship between cleavage and blastocoel formation in Xenopus laevis. I. Light microscopic observations.". Journal of embryology and experimental morphology. 26 (1): 37–49. PMID 5565077. ↑ Tadros, W; Lipshitz, HD (March 2005). "Setting the stage for development: mRNA translation and stability during oocyte maturation and egg activation in Drosophila". Developmental Dynamics. 232 (3): 593–608. doi:10.1002/dvdy.20297. PMID 15704150. 1 2 Etkin, LD (1988). "Regulation of the mid-blastula transition in amphibians.". Developmental Biology. 5: 209–25. doi:10.1007/978-1-4615-6817-9_7. PMID 3077975. ↑ Tadros, W; Westwood, JT; Lipshitz, HD (June 2007). "The mother-to-child transition.". Developmental Cell. 12 (6): 847–9. doi:10.1016/j.devcel.2007.05.009. PMID 17543857. ↑ Weigel, D; Izaurralde, E (24 March 2006). "A tiny helper lightens the maternal load.". Cell. 124 (6): 1117–8. doi:10.1016/j.cell.2006.03.005. PMID 16564001. 1 2 3 4 Fleming, Tom P.; Papenbrock, Tom; Fesenko, Irina; Hausen, Peter; Sheth, Bhavwanti (1 August 2000). "Assembly of tight junctions during early vertebrate development". Seminars in Cell & Developmental Biology. 11 (4): 291–299. doi:10.1006/scdb.2000.0179. PMID 10966863. ↑ Watson, J.G. (Oct 1977). "Collection and Transfer of Preimplantation Mouse Embryos". Biology of Reproduction. 17 (3): 453–8. doi:10.1095/biolreprod17.3.453. PMID 901897. Forgács, G. & Newman, Stuart A. (2005). "Cleavage and blastula formation". Biological physics of the developing embryo. Cambridge University Press. ISBN 978-0-521-78337-8.